The Office of Government Procurement is also awarding a tender worth €3.3 million for footwear for the Defence Forces. File photo. A garda's shoes. THE GOVERNMENT HAS issued an invitation to tender worth almost €6 million for the supply of footwear to An Garda Síochána and the Irish Defence Forces. The contract requires the supply of shoes “in all stock sizes to both male and female members” of the gardaí and Defence Forces. The estimated value of the tender for footwear for the gardaí is €2.5 million, with €3.3 million earmarked for footwear for the Defence Forces. The duration of the contract is three years, with the option of extending it by a further 12 months. After recent Budget provisions for an extra 800 gardaí, it is expected that there will be around 14,000 serving gardaí within the coming years. The cost of the footwear, then, comes to around €180 per garda over the course of this contract. In order to be awarded the contract, tenderers must submit two samples in sizes 9 and 10. 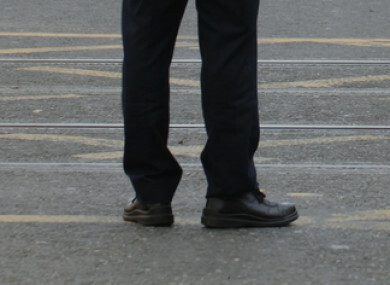 The gardaí require two types of footwear – a lightweight operational safety boot and a lightweight operational safety shoe. There are no fewer than 38 specifications that these shoes must meet – including the type of leather used, padding foams, inner lining, heel grip and the laces used. Examples are also given of what the shoes may look like when finished. As of 31 January, meanwhile, there were 8,921 Defence Forces in Ireland. The requirements for footwear for the Defence Forces, however, are more extensive than that of the gardaí. This includes flame retardant safety boots, flying boots for Air Corps members, and lightweight shoes for artillery units. Over the course of the contract, it works out at just under €370 per member. Within the tender documents, potential suppliers are also advised to consider any “Brexit considerations” in their proposals. “Tenderers must provide as part of their proposed business plan a methodology demonstrating in a clear and comprehensive manner how they propose to deal with the different possibilities of the Brexit outcome,” the documents note. Email “€2.5 million contract out for the manufacture and supply of shoes for An Garda Síochána”. Feedback on “€2.5 million contract out for the manufacture and supply of shoes for An Garda Síochána”.